بداقی, الهه, علی‌پور, فرشید, بداقی, مظاهر, نوری, ربابه, پیمان, نوشین, سعیدپور, صابر. (1396). نقش معنویت و حمایت اجتماعی در نشانه‌های اضطراب، افسردگی و استرس زنان باردار. 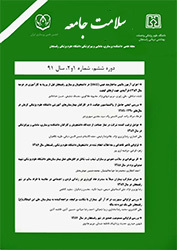 سلامت جامعه, 10(2), 72-82. الهه بداقی; فرشید علی‌پور; مظاهر بداقی; ربابه نوری; نوشین پیمان; صابر سعیدپور. "نقش معنویت و حمایت اجتماعی در نشانه‌های اضطراب، افسردگی و استرس زنان باردار". سلامت جامعه, 10, 2, 1396, 72-82. بداقی, الهه, علی‌پور, فرشید, بداقی, مظاهر, نوری, ربابه, پیمان, نوشین, سعیدپور, صابر. (1396). 'نقش معنویت و حمایت اجتماعی در نشانه‌های اضطراب، افسردگی و استرس زنان باردار', سلامت جامعه, 10(2), pp. 72-82. بداقی, الهه, علی‌پور, فرشید, بداقی, مظاهر, نوری, ربابه, پیمان, نوشین, سعیدپور, صابر. نقش معنویت و حمایت اجتماعی در نشانه‌های اضطراب، افسردگی و استرس زنان باردار. سلامت جامعه, 1396; 10(2): 72-82. 1کارشناسی ارشد روانشناسی بالینی، گروه روانشناسی، دانشکده روانشناسی، دانشگاه خوارزمی، تهران، ایران. 2مربی گروه روانشناسی،دانشگاه پیام نور اراک، اراک، ایران. 3استادیار گروه روانشناسی، دانشکده روانشناسی، دانشگاه خوارزمی، تهران، ایران. 4کارشناس ارشد روانشناس عمومی، دانشگاه آزاد اسلامی، واحد کرج، ایران. مقدمه: نشانه‌های اضطراب و افسردگی در زنان باردار از عوامل آسیب­زا محسوب می‌شوند که با حمایت اجتماعی و میزان معنویت نیز مرتبط می‌باشند، لذا هدف از پژوهش حاضر، بررسی نقش پیش­بین سلامت معنوی و حمایت اجتماعی در میزان اضطراب، افسردگی و استرس زنان باردار انجام شده است. روش­های آمار توصیفی و استنباطی شامل همبستگی و رگرسیون گام به گام مورد تجزیه ‌و تحلیل قرار گرفت. یافته­ ها: نتایج نشان داد که نشانه­های اضطراب، افسردگی و استرس رابطه معکوسی با حمایت اجتماعی (۶۷/۰- تا ۱۴/۰- r=) و میزان معنویت (۲۰/۰- تا ۵۵/۰- r=) دارند. یافته‌ها همچنین نشان داد که متغیرهای پیش­بین حمایت خانوادگی، معنویت و حمایت دوستان، 55/0 درصد از واریانس متغیر اضطراب، متغیرهای پیش­بین حمایت خانوادگی و معنویت 41/0 درصد از واریانس متغیر افسردگی و حمایت خانواده 18/0 درصد از واریانس استرس زنان باردار را پیش‌بینی می‌کنند. نتیجه ­گیری: نتایج نشان داد که اضطراب،‌ افسردگی و استرس در زنان باردار رابطه معکوسی با معنویت و حمایت اجتماعی دارد که پیشنهاد می‌شود به حمایت اجتماعی و معنویت در زنان باردار دارای نشانه‌های اضطراب و افسردگی توجه گردد. 3Associate Professor, clinical psychology. Kharazmi University, Tehran, Iran. Introduction: Symptoms of anxiety and depression in pregnant women are traumatic factors which are associated with social support and spirituality, therefore the aim of this study was to investigate the role of spiritual and social support in the prediction of anxiety, depression and stress in pregnant women. Materials and Methods: The method for this descriptive study was a predictive correlation design. The statistical population of the current study included all pregnant women referred to health centers of Shahid Eskandari Kalak and Shahid Turkiyan Rajaee in Karaj city in the second half of 2014. One hundred fifty five pregnant women were selected based on convenient sampling and considering the inclusion and exclusion criteria. Data was collected using perceived social support scale, spiritual health questionnaire, depression, anxiety and stress scale (DASS 42) and demographic data form. Descriptive and inferential statistical methods, including, correlation and stepwise regression were analyzed with the SPSS-22 software. Results: The findings of the research showed that symptoms of anxiety, depression and stress had inverse relationship with social support (r=0.14 in. .67) and spirituality (r=0.20 in. .55). The findings also revealed that family support, spirituality and the support of friends as predictor variables predict 55 percent of the anxiety's variance and family support and spirituality predict %41 of depression's variance. Finally family support predicts %18 of stress' variance in pregnant women. Conclusion: The results showed that anxiety, depression and stress in pregnant women have an inverse relationship with spirituality and social support. It is recommended that social protection and spirituality in pregnant women with symptoms of anxiety and depression should be considered. 1- Maryam GA, Shohre GS, Javad K. Effectiveness of Hardiness Training on Anxiety and Quality of Life of Pregnancy Women. Procedia-Social and Behavioral Sciences 2013;84:1785-9. 2- Huang H, Coleman S, Bridge JA, Yonkers K, Katon W. A meta-analysis of the relationship between antidepressant use in pregnancy and the risk of preterm birth and low birth weight. General hospital psychiatry 2014;36(1):13-8. 3- Lee AM, Lam SK, Lau SMSM, Chong CSY, Chui HW, Fong DYT. Prevalence, course, and risk factors for antenatal anxiety and depression. Obstetrics & Gynecology 2007;110(5):1102-12. 4- Mckee MD, Cunningham M, Jankowski KR, Zayas L. Health‐related functional status in pregnancy: Relationship to depression and social support in a multi‐ethnic population. Obstetrics & Gynecology 2001;97(6):988-93. 6- Ross LE, Grigoriadis S, Mamisashvili L, VonderPorten EH, Roerecke M, Rehm J, et al. Selected pregnancy and delivery outcomes after exposure to antidepressant medication: a systematic review and meta-analysis. JAMA psychiatry 2013;70(4):436-43. 7- Kurki T, Hiilesmaa V, Raitasalo R, Mattila H, Ylikorkala O. Depression and anxiety in early pregnancy and risk for preeclampsia. Obstetrics & Gynecology 2000;95(4):487-90. 10- Michael SY, Luckhaupt SE, Mrus JM, Mueller CV, Peterman AH, Puchalski CM, et al. Religion, spirituality, and depressive symptoms in primary care house officers. Ambulatory Pediatrics 2006;6(2):84-90. 11- Hamjah SH, Ismail Z, Sham FM, Rasit RM, Ismail A. Spiritual Approach in Managing Work-related Stress of Academicians. Procedia-Social and Behavioral Sciences 2015;174:1229-33. 12- Peach HG. Religion, spirituality and health: how should Australia's medical professionals respond? Medical journal of Australia 2003;178(2):86-90. 13- Sorajjakool S, Aja V, Chilson B, Ramírez-Johnson J, Earll A. Disconnection, depression, and spirituality: A study of the role of spirituality and meaning in the lives of individuals with severe depression. Pastoral psychology 2008;56(5):521-32. 14- Daaleman TP, Kaufman JS. Spirituality and depressive symptoms in primary care outpatients. Southern Medical Journal 2006;99(12):1340-5. 15- Giurgescu C, Misra DP, Sealy-Jefferson S, Caldwell CH, Templin TN, Slaughter-Acey JC, et al. The impact of neighborhood quality, perceived stress, and social support on depressive symptoms during pregnancy in African American women. Social Science & Medicine 2015;130:172-80. 16- Mann JR, McKeown RE, Bacon J, Vesselinov R, Bush F. Religiosity, spirituality, and depressive symptoms in pregnant women. The International Journal of Psychiatry in Medicine 2007;37(3):301-13. 17- Lau Y, Wong DFK, Wang Y, Kwong DHK, Wang Y. The roles of social support in helping chinese women with antenatal depressive and anxiety symptoms cope with perceived stress. Archives of psychiatric nursing 2014;28(5):305-13. 18- Müller R, Peter C, Cieza A, Post MW, Van Leeuwen CM, Werner CS, et al. Social skills: a resource for more social support, lower depression levels, higher quality of life, and participation in individuals with spinal cord injury? Archives of physical medicine and rehabilitation 2015;96(3):447-55. 19- Kim HS, Sherman DK, Taylor SE. Culture and social support. American Psychologist 2008;63(6):518-26. 21- Lovibond PF, Lovibond SH. The structure of negative emotional states: Comparison of the Depression Anxiety Stress Scales (DASS) with the Beck Depression and Anxiety Inventories. Behaviour research and therapy 1995;33(3):335-43. 23- Zimet GD, Powell SS, Farley GK, Werkman S, Berkoff KA. Psychometric characteristics of the multidimensional scale of perceived social support. Journal of personality assessment 1990;55(3-4):610-7. 24- Bruwer B, Emsley R, Kidd M, Lochner C, Seedat S. Psychometric properties of the Multidimensional Scale of Perceived Social Support in youth. Comprehensive psychiatry 2008;49(2):195-201. 25- Salami A, Joukar B, Nikpour R. internet and communication: perceived social support and loneliness as antecedent variable. Psychological studies 2009; 5(3): 81-102. [Persian]. 26- Pérez JE, Little TD, Henrich CC. Spirituality and depressive symptoms in a school-based sample of adolescents: A longitudinal examination of mediated and moderated effects. Journal of Adolescent Health 2009;44(4):380-6. 27- Bonelli R, Dew RE, Koenig HG, Rosmarin DH, Vasegh S. Religious and spiritual factors in depression: review and integration of the research. Depression research and treatment 2012; 62:97-106. 28- Moritz S, Kelly MT, Xu TJ, Toews J, Rickhi B. A spirituality teaching program for depression: Qualitative findings on cognitive and emotional change. Complementary therapies in medicine 2011;19(4):201-7. 29- Kim Y, Seidlitz L. Spirituality moderates the effect of stress on emotional and physical adjustment. Personality and Individual differences 2002;32(8):1377-90. 30- Rogers HL, Brotherton HT, Plaza SLO, Durán MAS, Altamar MLP. Depressive and anxiety symptoms and social support are independently associated with disease-specific quality of life in Colombian patients with rheumatoid arthritis. Revista brasileira de reumatologia 2015;55(5):406-13. 31- Volz M, Möbus J, Letsch C, Werheid K. The influence of early depressive symptoms, social support and decreasing self-efficacy on depression 6 months post-stroke. Journal of Affective Disorders 2016;206:252-5. 32- Ali NS, Azam IS, Ali BS, Tabbusum G, Moin SS. Frequency and associated factors for anxiety and depression in pregnant women: a hospital-based cross-sectional study. The Scientific World Journal 2012;65:1-9. 33- Ibarra-Rovillard MS, Kuiper NA. Social support and social negativity findings in depression: perceived responsiveness to basic psychological needs. Clinical psychology review 2011;31(3):342-52. 34- Alipour F, Hasani J, Oshrieh V, Saeedpour S. Brain-Behavioral Systems and Psychological Distress in Patients with Diabetes Mellitus A Comparative Study. Caspian.J.Neurol.Sci. 2015; 1 (2) :20-29.